This article is about the real world species. For the enemy from Yoshi's Story, see Clam (Yoshi's Story). Clams are giant bivalves that appear as rare enemies and obstacles throughout the Mario franchise. Their appearance changes slightly from title to title, but they retain their behavior of opening and closing their valves. A number of fictional species, including Clampies from New Super Mario Bros. Wii and Clambos from Donkey Kong Country, are derived from generic clams. 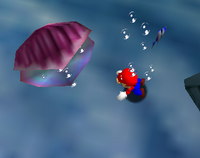 Clams are present in Super Mario 64 and its remake Super Mario 64 DS, appearing in Jolly Roger Bay and Dire, Dire Docks. Most clams in Jolly Roger Bay contain Red Coins, whilst the lone clam in Dire Dire Docks contains a Koopa Shell. If a clam is touched when it is opening or closing, Mario gets knocked away and takes two points of damage. Clams open up for a small period of time when Mario approaches them. Normal, organic clams themselves do not appear as a meaningful gameplay element in Super Mario Sunshine. However, plastic representations of them make up the Clam Cup ride in Pinna Park, which is advertised by some Nokis in a few missions. This attraction features six fake clams of different colors spinning around on a playground merry-go-round-like plate. They are normally closed, but spraying one enough causes it to open, revealing a coin, Blue Coin, or 1-Up Mushroom, if it contains anything at all. In Donkey Kong Country: Tropical Freeze, Giant Clams appear as a type of container found underwater. Like other containers, attacking near them causes them to open and release treasure. In Paper Mario: Color Splash, Wendy O. Koopa the fourth boss waits for Mario inside a Clam before the battle with her. In battle, she attacks by summoning coins from the Clams and dunking them on Mario. She also summons Gold Shy Guys, Silver Shy Guys, and Ice Bros from them to aid her in battle if Mario fails to block the attack. ↑ von Esmarch, Nick, and Cory van Grier. Donkey Kong Country: Tropical Freeze Prima Official Game Guide. Page 22. ↑ Shogakukan. 2015. Super Mario Bros. Hyakka: Nintendo Kōshiki Guidebook, Super Mario 64 section, page 91. This page was last edited on February 11, 2019, at 22:42.